1 August - A bit of a puzzle as far as nest 3 is concerned. 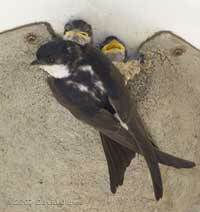 The pair of House Martins stayed in the box overnight, leaving at 5.53am. Ten minutes later they returned briefly. After that, there were four visits by a single bird before two birds appeared in the nest again at 7.34am. During this visit either mating or a fight occurred before both birds left again. Over the next 2 hours there were seven visits by a single bird and then nothing until 8.18pm when it was just one bird that entered again. It only stayed a couple of minutes before leaving again. Another short visit at 8.36pm was the last time I saw a Martin in there tonight. Shortly after it left nest 3 a Martin entered nest 2, remaining there as darkness fell. Over the last two days I've noticed that feathers have been taken out of nest 3 more often than they were brought in, and there are a number scattered on the ground below. The nest has quite a population of what I think are Martin Bugs as well as a few Flat-flies. Could the removal of feathers have anything to do with this? 2 August - A technical problem with our internet connect is causing us major headaches at the moment, and in order to try and pinpoint the cause I need to disconnect the webcams for several hours today - sorry for this! They should be available again by this evening. - and they were, although it wasn't anything that I did! I received from my internet provider a set of test commends to enter the next time my connection failed. That was lunchtime, and it has worked ever since. The problem strikes most often in the mornings so if the webcam fails tomorrow morning I apologise in advance. Hopefully the problem will not strike on the weekend, or when the eggs are hatching. Today I have not been able to pay too much attention to the nests but I have taken a quick look through the recording from this morning. 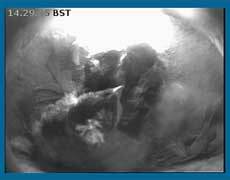 The pair in nest 1 were together until one left at just after 6.30am. After it returned 15 minutes later, it was half an hour before one left again. This time it was out for 40 minutes before the pair were together again for 12 minutes. 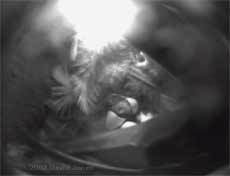 Another trip out was followed by both birds staying in the nest for some 90 minutes (shortly before 10am) before they began the daytime pattern of taking turns to incubate the eggs. Tonight, the pair were settled in soon after 8.30pm. The bird that spent the night in nest 2 left for the first time at 5,55am. Around 6.30am there was a visit to nest 2 and then nest 3, and then three more visits to nest 3 in a period of a few minutes around 7.50am. Look carefully and you can just make out a Flat (louse) fly on the back of the bird in nest 2. There may have been a few more visits to nest2/3 during the day, but tonight both are empty - a bit disappointing. 3 August - Hatching has started! More details later, but when I switched on the monitors at a rather tardy 8.30am I was greeted by a momentary sighting of a broken egg shells and two chicks. I wasn't ready to capture images at that time, but this is a webcam image from later on that shows the two chicks. At 10.20am that situation hasn't changed, the first chicks have been fed and and the remaining eggs are still being incubated. In this image you can see that the adult has food in its beak. The second chick is hidden behind a feather. At 5.30pm there are still two eggs waiting to hatch. Sorry if it causes a bit of confusing, but I have swapped over the webcam connections to see if the image from nest 1 will be stripe-free when processed through the other laptop. It's possible that the composite image will now suffer from the problem, but that will be less annoying! and the chick was revealed when the parent moved to one side to inspect the eggs. Over the next hour or so there were six change-overs, giving me more chances to see the chick (I may add some images sometime tomorrow), but the second egg didn't hatch until a change-over took place at 8.22am, and while both adults were in the nest. During the exchange the adults paused long enough for me to watch the chick as it struggled to free itself, although it was hidden again before it completed the task. Although the image quality is low you can make out the chick's long down, looking more like rather tatty ribbons while still wet. Tonight, there are still two eggs to hatch. 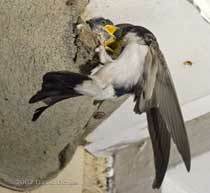 Both adults are in nest 1. 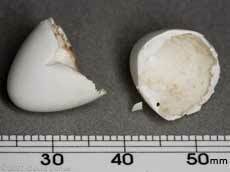 However, nests 2 and 3 are unoccupied. 4 August - Chicks #3 & 4 have hatched. At 8.15am on a bright and sunny morning there are now three youngsters, although I have not yet been able to capture an image that shows them clearly. The fourth chick hatched sometime after 11.15am. I'm afraid that I have been having worst than usual problems with my internet connection this morning. I am getting very frustrated by it. My internet provider is trying to convince me that the fault is within my equipment, and I'm certain that it isn't. The trouble with intermittent faults is that as soon as you start trying to track them they disappear again! It had been suggested that I need to disconnect my router and run just one computer, directly linked to my internet link. If I do this it will mean losing the webcams for at least a day. If possible I'll wait until after the chicks have fledged. 6 August - Sorry but I've have finally had to give up on using my internet for the webcam. Yesterday things got from bad to worst and by the evening there was only a spasmodic internet connection. On a positive note, when I phoned the helpline I ended up talking to someone in Delhi, India who couldn't have been more helpful and in a few minutes she had agreed that the fault lay with the network provider's connection or cable modem. Unfortunately I now have to wait until Friday (10 August) for an engineer to call. I hope that the webcams can be put back on line after the visit, and in the meantime I will be adding to my diary (and doing a bit of catching up with the garden diary) and updating the website when I find that the connection happens to be working (which is why you can read this!). By the way, the four chicks seem to be well this morning. I will try to capture some images a bit later in the day. 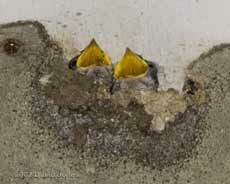 There has been no further activity seen in nests 2 and 3. 8 August - I have yet to catch up with diary entries, but my internet connection has decided to behave today as I have switched webcam 2 back on. Hopefully it will continue to function, although I cannot guarantee its stability until after the engineer's visit in two days time. 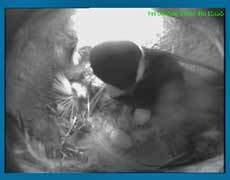 Everything seems to be going well in the nest. There is still an adult in there for most of the time, and this evening I hope to go through the day's recording to count the number of feeds brought in. 14 August - Well, the internet connection works fine now, with a new cable modem having been installed at the end of last week. Having said that, the poor quality of the webcam images today must be blamed on the weather. It has been dull and wet, and there has been at least one adult in the nest with the chicks all through the day. The four chicks appear to be doing well, and yesterday I saw one reverse up to the entrance for the first time to (presumably) deposit a faecal sac outside the nest. Thinking back to the hatching of the eggs, I didn't see the adult eating any egg shell, and I found two shell halves on the ground below. I was surprised just how delicate they are. When freshly collected they seemed to flex slightly when handled, and thinner than I had expected. I measured a few fragments and found that the thickness was just over 1/400in (0.0026in, 0.066mm). In comparison, the ordinary paper that I use in my printer is about 1/250in (0.1mm) thick. It's amazing how a structure so thin is able withstand the treatment the eggs got as the adults tread on them, sit on them and roll them about in the nest prior to hatching! I must apologise for the continued lack of diary entries to accompany the webcam. I have been watching and recording a couple of hours each day, but I'm afraid that the CFS that is plaguing me at the moment seems to drain both energy and powers of concentration to do tasks like processing images etc. When things get back to normal for me I will try to put together a record of what has happened. 15 August - A day of sunshine and showers, and which saw a big step forward in the progress of the chicks as they started taking food at the entrance. I spent some time outside this evening and this is my first picture of two of the chicks looking out just after 8pm this evening. They didn't have to wait long before one of their parents turned up with a feed. I spent about half an hour outside, and in that time I didn't see any other Martins, and there was no sign of Swifts. At just before 8.30pm I had to retreat inside when rain started to fall. As I walked under the nests the chicks were being fed, and another adult had just entered nest 3. 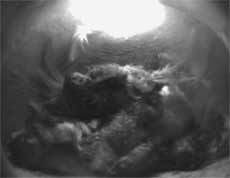 Unfortunately, I cannot capture any more images in nest 3 as we have been hit by another technical hitch - the camera seems to have failed. In the Autumn I will need to replace that camera, and I will probably take the opportunity to make some other changes. I may try installing a colour camera in nest 1, although I'm still sceptical about the light levels. I will certainly change the positioning of the nest 1 camera to reduce the reflection problems that cause the birds to peck at it when they first started nesting, and I may change the lens on the external camera to give a slightly closer view of the nests. Now that the chicks have started feeding at the entrance the nest 1 webcam image quality is going to become less useful, so I'm going to turn on the second webcam again, this time connected to show the view from the external camera rather than a composite image. 16 August - A brighter day, with long periods of sunshine, although it stayed quite cool, with a high of just 18C. 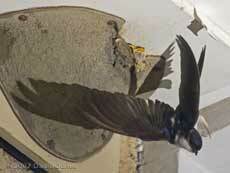 As I said yesterday, for much of the time the images from inside nest 1 have been very poor. When the chicks haven't been blocking off the light, they have been tending to keep their heads down, their downy feathers making them appear to blend together. While I watched, only occasionally did a chick stand out from the rest. Here you can see the tufts of longer down that decorate the sides of their heads. You can see these in several of the colour photographs. I spent much of the day doing various jobs, but found time to spend a while out the front of the house watching the Martins. It would have been easy to take lots of pictures, but as I needed to use flash I only did so every few visits. Here are some images from today (not in order). Arriving at the nest, the parent has to hang on and use its tail as a support while the chicks reach forward to claim the insect(s) being offered. Sometimes he/she doesn't get its position quite right, and then the tail appears to be of very limited use. Food handed over, the adult then needs to check that the coast is clear before it leaves. I like the expression on the face of the left-hand chick! Finally, the Martin launches itself into the air, swooping down quite low before heading back up into the sky. On one occasion I felt the breeze at one flew past me. The last feed of the day was at around 8.30pm, after which the adult went into the nest. 20 August - After an over-night low of 11C, today the temperature struggled to pass 14C. Perhaps it's down to these low temperatures, but the adults have been conspicuous by their absence today. I have reviewed some eight hours of video, starting around 10am (but with a gap of twenty minutes half way through) and I saw no food delivered at all. 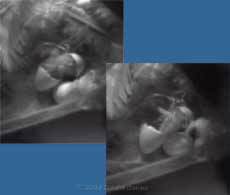 Over that same period only three faecal sacs were deposited out of the entrance, reflecting the lack of food eaten. While I did see visits yesterday when the maximum temperature was 16C, the chicks were not crowding the entrance but staying in a huddle, and the adult had to take the food into the nest. 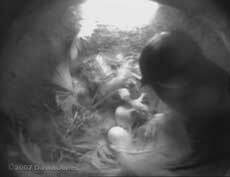 Today, the chicks have behaved in exactly the same way, their downy bodies almost blending into a single shape. 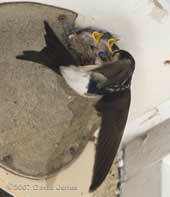 While I saw a Martin enter nest 3 at 8.10pm, I don't think that an adult has returned to nest 1 tonight. I wasn't recording continuously this evening so I shall have to record tomorrow morning from before dawn to see if I missed any late arrivals. According to my books fledging is due over the next few days, but the chicks look nowhere near to being ready. They have very short tail feathers and from what I can make out, their flight feathers still have a long way to go. 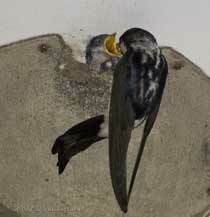 I know that Swifts can delay fledging for quite a long time if the weather is not favourable, but I don't remember having seen it mentioned anywhere about House Martins adopting a similar strategy. 21 August - A sad end - the chicks have died. On another grey and damp morning, this is the sight that greeted me when I turned on the monitor at 8.30am. The only movement to be seen in the box is that of the parasites that no longer have living hosts - the chicks have not survived the night. I will add more comments over the next few days, when I have chance to relax as our bedroom redecorating comes towards its conclusion. 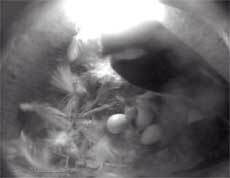 In the meantime, this evening I have switched off the nestbox webcams until next year.